Darlington’s award-winning Dolphin Leisure Centre, conveniently located right in the heart of Darlington, has the perfect facilities for all your leisure needs. Recently refurbished throughout with upgrades to the swim changing facilities, new ‘Under the Sea’ themed soft play area and state-of-the-art dedicated fitness Pulse Suite, it’s second to none. Choose from activities to suit all tastes such as swimming in a 25m pool with flume slides, training and diving pools, a climbing wall, badminton, squash, table tennis, football, martial arts, racquet sports, fitness suites, fitness classes and specialised activities for the under 5s and over 50s. 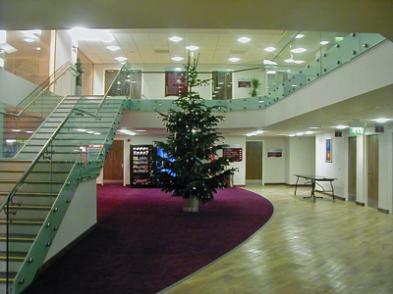 The Dolphin Centre also stages a wide range of speciality events such as concerts, musical extravaganzas, boxing, exhibitions, galas, balls and much more. Add to the this their new theatre box office, stylish open plan bar and restaurant and the popular bar and bistro, 16 Horsemarket, all part of the complex, and it’s not hard to see why this centre is so popular with visitors and residents alike.